Many scholars researching manuscripts are interested in the characterisation of the type of inks found on such manuscripts as this adds vital information to the identification of the age and source of a manuscript. Our knowledge about the composition of the inks used in manuscripts is limited and even more importantly in order to analyse the composition of the inks we had to use destructive chemical analysis. In most cases this meant the extraction and analysis of actual samples from the original manuscript. With old and valuable collections even the use of very small samples is not a viable option as archivists and librarians will not allow any intentional destruction of the document, however small that it is. An automated computer-based technique for the characterization of inks of unknown chemical composition, offers a desirable and non-destructive method that can be applied to most manuscripts. In this paper we present such a new method, which is based on advanced digital image processing techniques and results to an automated and non-destructive examination of manuscripts by providing visual analysis of ink samples. Our techniques have been applied to inks found on Byzantine manuscripts. These inks were characterized through the creation of computation models using only visual information. The images used in our experiments were taken within the visible and near infrared spectrum. There is an enormous number of archived manuscripts worldwide. Many of these manuscripts cannot be accessed directly as they belong to very old and in most cases fragile collections. There are several techniques which enable us to identify date and place of the fabrication of the manuscripts. These techniques rely on some form of testing of the ink or the paper used. Traditionally though this testing involves sampling and laboratory analysis of the ink and paper of the manuscript. The method presented in this paper is completely non-destructive and is based on a computerised model of the visual properties of the composition of the inks under test. Until now our knowledge about the types of inks used in medieval manuscripts is sparse and it is mostly based on the physical-chemical analysis of inks. Such methods however are destructive to the manuscripts and therefore their use is very limited if allowed at all. The transportation of manuscripts to specialised laboratories is not required. It is not necessary to extract any ink samples from the manuscripts. Image-based techniques allow for the analysis of visible inks that are discoloured. Areas of interest for analysis on the manuscripts can be easily isolated. In this paper we present our results on the non-destructive identification of some types of inks used during the Byzantine period. In the remainder of this paper, first we give a summary on the types of inks used on Byzantine manuscripts and their characterisation based on their chemical composition. In Section 3 we describe our current experiments based on samples of script-panels before we conclude in Section 4. Carbon inks, which contain carbon, gum and solvent. Iron-gall(or metallogall) inks, which contain metallic salt (copper sulphate or ferric sulphate), galic oxide, gum and solvent. In this category are found the incomplete inks, which have composition similar to the iron gall inks but do not contain all of the ingredients of iron gall inks. In our first experiments, which created the basis for our current work, we used old recipes to create 8 of the most common inks used in the Byzantine period. Following that we developed an experimental panel with eight squares, each containing a sample of one of these inks. The panels were photographed individually under ultraviolet, visible and near-infrared light (360 - 950nm). Analysing the results we noticed that although the inks demonstrated the same high degree of absorption under the ultraviolet light, there was a very distinct difference under the near-infrared light[All images were adjusted to the same grey scale with the help of Image Pro Plus. With the aid of the same program we measured the absorption degrees for each ink]. Closer analysis on the optical behaviours of the inks under visible and infrared radiation showed that inks that have very similar photometric properties under visible light, can be separated when viewed under infrared radiation. These results have been presented at the 6th International Conference on "Non-Destructive Testing and Microanalysis for Diagnostics and Conservation of Cultural and Environmental Heritage" [Alexopoulou et al 1999]. Fig 1: Two of the script samples (ink 1 and ink 2). The recording of the optical behaviour of the samples in the visible and near infrared radiation has been performed using a couple of tungsten photolamps, the 489 and 093 B+W optical filters and a CCD infrared reflectograph sensitive up to 1200nm along with the image PRO- PLUS processing system. A standard black and white scale of 14 grey level tones has simultaneously been recorded in each reflectogram. This is shown in Figure 2. In this way it is easy to control the experimental conditions of the recording of the absorption of the ink samples as well as the acquisition parameters of the reflectograms set by the image acquisition software. All images were adjusted to the same grey scale with the help of Image Pro Plus. With the aid of the same program we measured the absorption degrees for each ink. The study of inks under scripting conditions, however, raises the question of isolating the reflectivity of areas where ink is present. 'Non-ink' areas may introduce noise for example dirt, paper impurities, ink which has penetrated the paper from the back side of the page being tested etc. This noise distorts the readings and is extremely difficult to remove after the measurement has been taken. To overcome this problem we have developed a number of masks, which only permit the measurement of the reflectivity of the 'ink areas'. 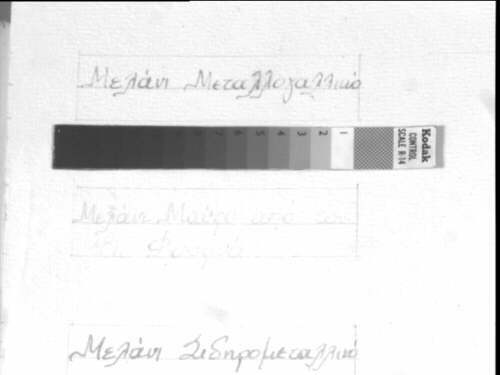 All photographs of scripts were taken together with a standard black and white scale (See Figure 2). By using the scale as reference we adjusted al images so that the results were as close to the same light and colour conditions as possible. We also adjusted all images so that there were not differentiations of 'illumination' (light) at various parts of the image. Usually this occurs at the edges of an image and is almost always down to the positioning of the camera and the light source used. We removed (using a suitable mask) the non-ink areas. We have also ensured that the ink samples were well separated so that there was no cross-interference. Fig 3: Typical hand script sample where the distribution of ink is not uniform. In this case even though the ink is the same, the reflection generated by the above sample gives different values depending on the different areas of the image. Furthermore, the transparency of the ink in some areas means that the ink reflectivity was mixed with that of the paper. The squares on the other hand, were more uniform as they are in fact painted rather than "written", and as such the distribution of the ink was more uniform. The values recorded using the squares are shown in Table 3. To get similar results from the scripts and avoid the above we started creating the same script but with several layers of the ink (effectively overwriting the text several times). To identify the number of layers which could give us consistent results and similar to those of the corresponding squares we created samples of each script using up to 10 layers of ink. The different measurements for the overwritten scripts can be seen in table 2. The notation in that table is as follows: ink<INK_NUMBER><LAYER_LETTER>. For example ink2C indicates the measurement of the script for ink number 2 at the third layer of ink (2 overwrites). By comparing the two tables it is obvious that in order to produce the same clear results as with the squares, we need to over-write the scripts nine times (ten layers of ink). Based on the presented measurements, it is obvious that the reflectivity of inks in the near infrared area of spectrum enables us to categorise them and to identify their ingredients. However, as presented, it is possible to differentiate the tested inks based on images of squares of inks (i.e. when the concentration of ink is very high), but not (always) directly from script samples. The latter is due to the fact that it is difficult to differentiate/characterize the inks from script samples as the natural ink transparency allows the measurement to be affected by the reflectivity of the paper itself. To avoid this and reach the same results as with the 'squares', we had to increase the number of layers of ink applied to each script sample to 10. At that level of concentration we have also observed that the difference between the inks was more and more apparent (see table 2). Furthermore, we have also observed that there is a proportional difference in terms of reflectivity between the different layers. The more absorption radiation that an ink has under infrared light, the more the absorption degree changes from the small number of layers sample as we increase the layers (irongall ink). On the other hand, inks, which demonstrate small absorption degree under infrared light, have small width difference from the absorption degree of the small number of layers measurement to that of higher number layers (incomplete ink of type B). Moreover, the absorption degree of inks not containing metal salt is more than the absorption degree of inks containing metal salt. Among metallogallic inks, the ink of Fourna has the lowest absorption degree in all layers. For a comparison of the intensity measurements of the different inks after 10 layers see figure 4. Create and apply masks that will allow us to measure the intensity of the "areas of interest" (ink-only areas). Current work includes further enhancement of the intelligent pre-processing for the automatic extraction of the noise, especially the paper introduced noise (in order to improve results on the script images) and the use of higher resolution infrared images. Alexopoulou A., Chryssoulakis G., "Sciences And Works of Art", 1993. Alexopoulou A., Kokla V., "Physicochemical study of inks of manuscripts using ultraviolet and near infrared radiation", 6th International Conference on "Non-Destructive Testing and Microanalysis for the Diagnostics and Conservation of the Cultural and Environmental Heritage", 1999. Barrow W.J., "Manuscripts and Documents", University Press of Virginia, 1972 second edition. De Pas Monique," Etat des travaux effectues sur l' analyse des consititues des encres noires manuscripts par deux technique: chromatographie sur couche mince et electrophorese", Comite pour la conservation de l' ICOM, 1975. Flieder F., Barroso R., Orvezabal C., "Analysis des tannins hydrolysable susceptibles d' entrer dans la composition des encres ferro-geliques", 1975. Elpidio Mioni, " Introduzione alla Paleografia Greca", 1973. Kodak Publication No N-17, Kodak Infrared films, or from Scientific Photography Markets, Eastman Kodak Company, Rochester, N.Y., 14650. Kokla V., "Manuscript 16th century. Substation through the physicochemical techniques", Works of degree, 1992. Mariolopoulou P., "Proposal about the methodology for the use of reflectivity in combination with the digital image on the measurement of reflectivity of pigment coat in the infrared and visible area", Work of degree T.E.I. of Athens, 1997(in Greek). Lou Gibson H., "Photography by infrared, 3rd Edition, its principles and Applications", edited by Walter Clart, 1978. Lucas Al. **, "Ancient Egyptian Materials and Industries", 3rd ed., Edward Arnord & Co., 1948. Society of Archivists Great Britain, "Criteria for software evaluation checklist for archivists/a paper produced by a working group of the society of archivists information technology group committee", London, 1993. Vourvopoulou Ch., Perdikari E., "Recognition of inorganic pigments in the infrared area through the optical microscopy", Work of degree T.E.I. of Athens, 1997(in Greek). Zerdoun Bat-Yeouda Monique, "Les encres noires au moyen ages(jusqu' a 1600)", edition du CNRS, 1983.